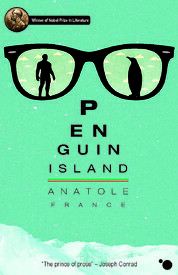 Penguin Island by Anatole France is a strange book so to say or that’s what I thought when I first started reading it. It is probably nothing like I have ever read before and maybe that is why I did not have a reference point to compare it with, which in a way was the best way to read this book. So let me straight get to the plot: A monk discovers a previously unknown island. He is half-deaf and half-blind because of age. He cannot see the people clearly (or so he assumes them to be people). He wants to create a world out of this island and ends up performing a mass baptism, only to realize later that the baptism has been carried out on Penguins. What begins is the creation of Penguin Island. They start living as humans. They develop laws, communities, dress, and ways to cohabit and procreate. They create their saints and their demons. It is almost like The History of Penguins being written by accident. The book for sure is funny, but at the root of it, it is sarcastic, satirical and mocks the times we live in. What happens at the end is quite unusual and will literally leave the reader surprised. That is the crux of the book, which I found most appealing. The book moves through just about everything on Penguin Island – vices, scams, false accusations, politics, the usual goings-on of the so-called society. Anatole writes with a rhythm that does not leave any societal construct unmasked. The satire bites where it is supposed to. The writing is blunt and not sugar-coated. I only wish I knew a little more about world politics, more so Europe as this book indirectly addresses those issues. It is surprising how a book written in almost 1900’s can still be so relevant today. May be the world hasn’t moved on as fast as we have thought it to be. I liked the writing. I liked the book. I wish that there was more meat at times, connecting the world of Penguins to the incidents that have taken place in ours, just for the overall perspective. Barring that I enjoyed reading this one. It made me think and at the same time it made me laugh out loud in most places. A great read that I will recommend but only if your sensibilities are driven in that direction. This entry was posted in Books, Enlighten Publishing, Fiction, Review and tagged Anatole France, Enlighten Publishing, Fiction, french, Penguin Island, satire on July 9, 2012 by thehungryreader.